We're celebrating the Pet Battle Bonus Event this week by sharing a pet that's part of a Squirt leveling team. Squirt just made her appearance for NA/Oceanic realms, and she will not be back during this month's Bonus Event. However, EU players rejoice! A "Super Squirt" day is coming up on August 26. That being said, this month we're covering the Blighthawk! Be sure to check out the forum post linked at the end of this article for the Squirt leveling team that incorporates the Blighthawk. 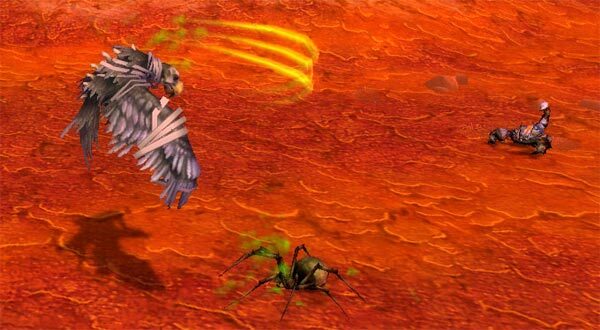 The Blighthawk is an Undead wild pet that can be found as level 10 - 11 in Western Plaguelands and as level 25 in Val'sharah. It has 4 different breeds. Western Plaguelands can be somewhat of a headache if you haven't made any quest/story progress in that zone. Phasing can cause problems for pet collectors looking for a wild Blighthawk. If you have the time and desire, simply progress the storyline for Andorhal to achieve proper phasing with the Blighthawks. If you'd prefer to skip the quests, one trick is to keybind the 'Interact with target' function. Use a '/target Blighthawk' command/macro to target one of the phased Blighthawks, and then use your interact keybind to engage it in battle. Another way to collect this pet from Western Plaguelands is to battle other wild pets in the zone. The Blighthawk can spawn as a secondary pet, making it possible to find and capture one even if their main spawn location is phased for you. Of course, skipping Western Plaguelands and opting for a higher level Blighthawk is another option. This pet also spawns around Bradensbrook in Val'sharah, although not nearly as often as it can appear in Western Plaguelands. The upside to collecting the Blighthawk from a Broken Isles zone is its level; you won't have to put as much time or energy into leveling it to max. The Blighthawk is definitely a unique looking Undead flyer, and is a must have for any collection! The Blighthawk is an abomination, stitching together two families into one damage dealing powerhouse with a few tricks to spare. Its two first slot abilities are a great example of this. You could go with big Undead damage in Infected Claw, or switch things up with the multi-hitting Flying move Slicing Wind. The Blighthawk retains many abilities common with other owl-type pets. Cyclone, a team-wide pseudo damage over time ability subject to RNG, is a very common Flying move, though it does prove a unique asset among Undead pets. The Blighthawk also uses Lift-Off, providing this pet with a useful dodge move with decent damage to boot. Those two abilities share the third slot, leaving the second slot open for two Undead moves. Those two Undead moves are really where your choices for the Blighthawk get interesting. You could choose Ghostly Bite, a move which deals huge damage, but at the cost of stunning your Blighthawk for the next turn. The other option is Consume Corpse, which heals the Blighthawk by ‘consuming’ a pet which is currently pushing up daisies on your team. Ghostly Bite is a great move on a res turn as an early pet, since you don’t need to worry about being stunned if you’re about to die. Meanwhile, the choice of Consume Corpse means your Blighthawk needs to be the last on your team alive. Both moves can be decent, so it’s up to you to decide based on your needs. The Blighthawk is an excellent pet for hard-hitting dps in most situations, as long as you stand downwind from its little undead self. 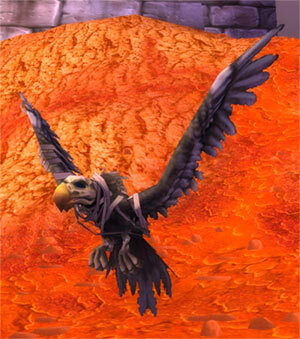 Check out the Squirt leveling team that uses Blighthawk in the forum discussion on this pet!